These cupcakes were made for the last Seahawks game. 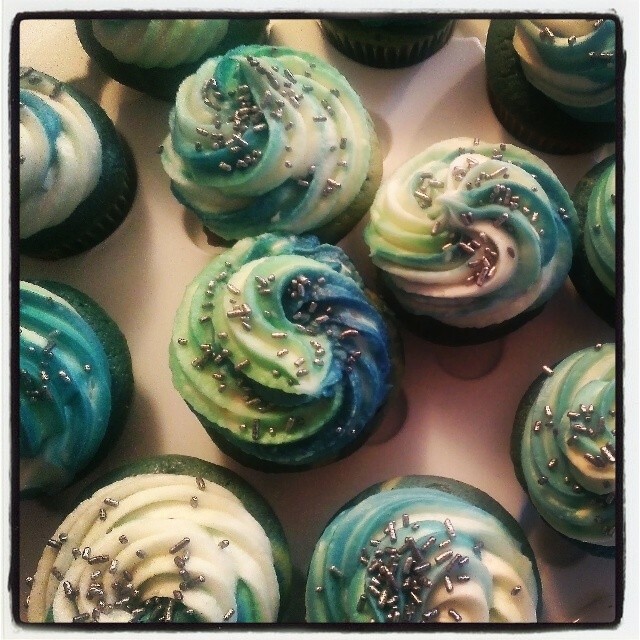 I used my “Pirate Rum Cupcakes” recipe and added blue and green food coloring to the cake and frosting. I’m excited to make more for the Super Bowl this Sunday! Go Hawks! I’m giving this new type of post a try, where each week I bring you a list of links I’ve found and loved. These are things that have entertained or intrigued me, or are awesome products/people I want to support. It’s similar to the Friday Favorites I’ve done in the past, but focused on links. Let’s do this! Noob The Loser: A tumblr featuring original comics, my favorite being one about a D&D group. (That’s the one linked to here.) It’s hilarious and will hit close to home for folks who have played D&D before. Super Knocked Up: A super villain and a super hero get together, and the villain ends up knocked up. (Or… “Super Knocked Up.” Get it?) This cute web series just won an IAWTV award for best supplemental content! Way to go guys! Whole Foods Meal Plans: After the Super Bowl is over, I’m gonna need to start eating healthy again. And I’m looking forward to trying one of the meal plans that Whole Foods put together. I’m especially loving their “healthy comfort foods” plan. Cashtronauts: This is a fast-paced, retro arcade-style game for PC/Mac/Linux that’s now available on Kickstarter. It looks like a lot of fun! SciFiDeals: Get Free and deeply discounted Sci-Fi eBooks sent to your inbox! Pretty sweet! Geeky Sprinkles: My Kickstarter for Geeky Sprinkles is over 50% funded! If you want to get your hands on some geeky sprinkle shapes, make sure you back the project! Thanks for the Cashtronauts shout out. Go Sea Hawks!